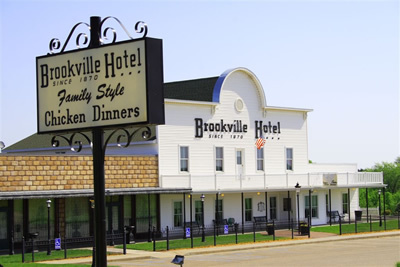 The Brookville Hotel is a finalist for the 8 Wonders of Kansas because of its famous family-style chicken menu that has been serving people since 1915! Relishes, sweet-sour cole slaw, skillet fried chicken, mashed potatoes and cream gravy, cream-style corn, baking powder biscuits with creamy butter and preserves and home style ice cream--that's the famous Brookville Hotel menu. Mmmm....good! It's served family style and it's about as legendary a menu as you can find in Kansas. Helen Martin, daughter of owners Gus and Mae Magnuson, originated the famous family-style chicken dinner in 1915 and in 1933 she took over the hotel. Additions were made to the hotel in 1948 and 1960 when a third generation family member, Cal Martin, became a partner in the management. Further additions were made in 1971 and 1978, increasing the serving capacity to 200. In 1982, the fourth generation, Mark and Connie Martin, took over. In 1999, they made the decision to move the restaurant to Abilene, closer to the Interstate. Though it was hard for many to see the historic restaurant leave Brookville, the Martins did the best they could to replicate the facade of the original hotel and retain the decorations and feel of the original. 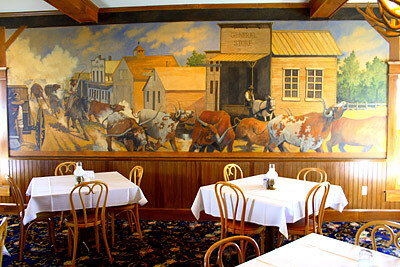 They have added colorful Kansas murals and still serve the famous menu on Blue Willow plates. 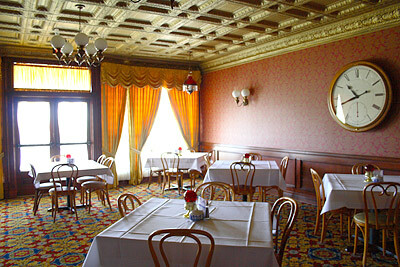 Recently named one of America's Classics by the James Beard Foundation, the Brookville Hotel is the most recognizable eatery in all of Kansas. Location: I-70 Abilene exit 275, north side one block on Lafayette Drive. Hours: Tuesday-Friday 5-8 p.m.; Saturday 11:30 am.-2 p.m. and 4:30-8 p.m.; Sunday 11:30 a.m.-2:30 p.m. and 5-7:30 p.m. Reservations are recommended.